God bless you for agreeing for His will in our lives as we surrender and submit to His will and ask in faith believing, according to God's purpose, and from God's riches in glory and not our human limitations or lack. We have many lost loved ones here living in fear, darkness, ignorance, sinning greatly against innocent children and grandparents. All human intervention, profession and legal failed; both nothing is too hard for God, and He is not willing any perish. 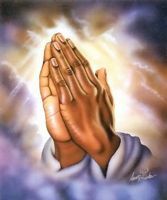 We ask for God's will in a complete, immediate reversal of all evil trends and deeds done to those who love God, here. We ask the Holy Spirit woo, convince and convict them of their sins so that they will know God loves them and turn from their wicked ways. We ask for a total turn around of the dark order, liable, slander, perjury, gossip, lies, rumors, assault, attack and that reconciliation, restoration, healing, protection and deliverance will be brought at once, to the glory of God. We worship, thank, praise God and claim this victory of truth, goodwill, grace, mercy, forgiveness.